BWG employees understand that education is key for its customers’ success, Bill Prescott explained. [Mansfield, Mass.] Family owned since 1981, the Belknap White Group (BWG) is one of the largest flooring distributors in the U.S., servicing New Jersey, New York and New England. The distributor offers more than 100,000 SKUs as well as nine solution center locations throughout its territory, and has seen success since its beginnings. So, BWG works closely with the manufacturers, as well as the local and national associations, to provide off-site training by channel segment. “We train the flooring contractor, the dealer and we also train the architectural community. Most importantly, we tweak our training based on audience,” he said, adding the company takes a two-pronged approach to education. 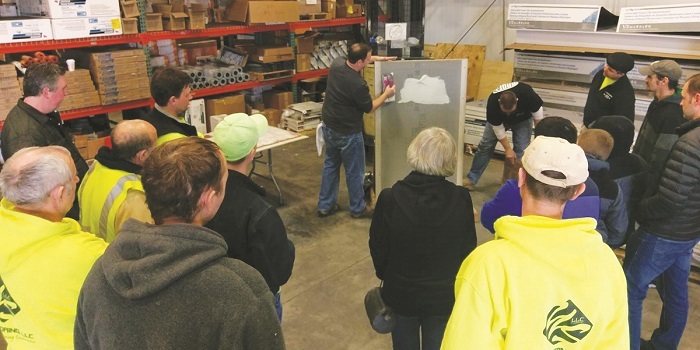 The trainings are done face-to-face at BWG’s floor covering solution centers, or off-site at a local hotel or convention center. Prescott revealed the sessions can involve up to 90 trainees, and are held based on new products the company is distributing. In the summer, BWG hosts vendor-sponsored cookout trainings once a week. Monthly, the company offers formal trainings at open houses for flooring segments such as ceramic, LVT, wood and supplies. Now, gauged porcelain tile is on the rise, so BWG committed to educating trainees on the new product once a quarter. “It’s a growing segement. Without training, it will never get to where it needs to be,” said Prescott. Click here to view the story on the Floor Covering Weekly Web site.